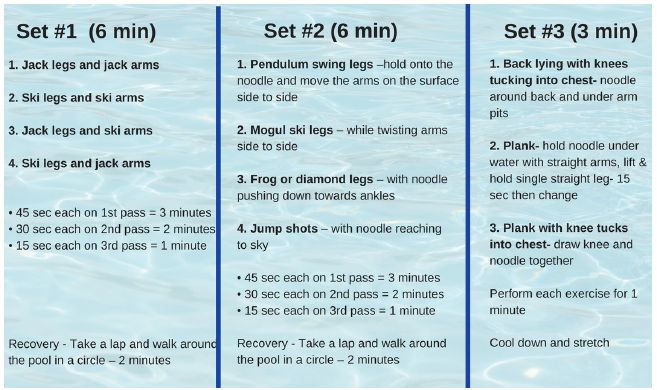 Swim instructor and group fitness lead, Amy, brings us this high-intensity interval workout for the pool! This workout is a refreshing way to get your heart rate climbing in a low-impact style. Make sure to warm-up with 2 minutes of water walking – be mindful to stand tall and press your heels to the bottom of the pool. This workout takes about 20 minutes, but feel free to complete more rounds if you’d like. Perform 3 rounds or ‘passes’ of Sets #1 and #2 at the given duration's.